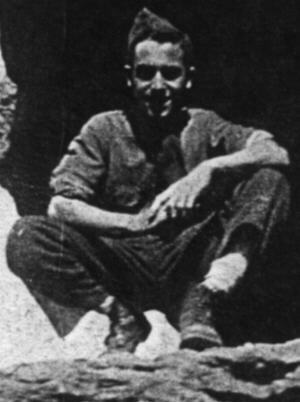 I, Nicholas M. Cirillo from Philadelphia, Pennsylvania, joined the CCC when 17 years of age in 1940. I was thinking I was going to the "moon". I was sent to New Cumberland, Pennsylvania to a reception center for processing on January 3, 1940 and spent three days there. I was then sent to Company 311, Camp F-32-A in Oak Creek Canyon, Sedona, Arizona. My discharge says this was Clarkdale, Arizona, but I don't know why. Flagstaff was also nearby. In January I wrote a post card home with a photo of the camp and told my family that I was having a good time and that the weather was nice, it was 70 degrees there at the time. I served with my cousin, Daniel Cirillo who also joined the CCCs. We worked for the Forestry Department under the project Superintendent Mr. Frank J. Randall. Our duties were road work also about one month near Flagstaff AZ there was a nursery area where trees were planted. Bed areas of 3 yr old trees shipped them out through out USA ( yr 1940 ) Forestry. The CCCs transplanted 45 million trees and shrubs for landscaping and planted some 3 billion to reforest logging and fire damaged forests. Nurserys like this one supplied the trees. I was there until June 15, 1940 when my enlistment ran out. I returned to New Cumberland and was Honorably discharged with satisfactory ratings on June 20, 1940. I enjoyed my experiences. The Emblem of the CCC !